Now I put them in the soil, the tasty spuds. We don’t have any place for them yet, so we plant them in a bucket. You can do that on a balcony as well. A bucket of potatoes equals a meal. Not much but enough to save the Swedish midsummer. Add some home made pickled herring, and house spiced spirits. I’ll come back to the latter in the future. This is how you grow your own potatoes. It’s easiest to buy seed potatoes at the garden centre. Put them in an egg carton to start the growing process. After a couple of weeks the sprouts pop out. Take a sturdy bucket, or use one made for plastering. Cut holes abut five centimetres from the bottom for the drainage. Add 10 centimetres of any kind of soil. Put 1-2 potatoes per bucket. Water regularly and add more soil when the plant is growing. This is to avoid green potatoes which contains a poisonous substance. Fill until the bucket is filled with soil. 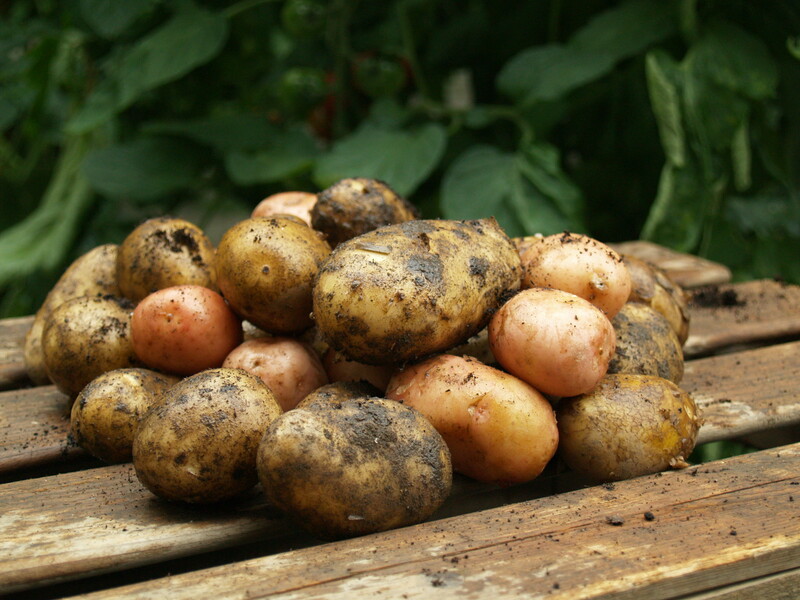 The spuds can be harvested when the plant flowers around midsummer. Eat and dance around the midsummers pole.